Interpretive fliers that describe the trees, shrubs and geological features along the Cook Interpretive Loop Trail are available in a box at the trail head. The numbers on the ASLPT signs are keyed to the flier. The Cook Interpretive Loop Trail (pink flagged, indicated in red on the map) starts at the parking area (P) along Whitney Brook Road where the Ausbon Sargent Land Preservation Trust (ASLPT) sign #49 is visible from the road near the power line crossing. 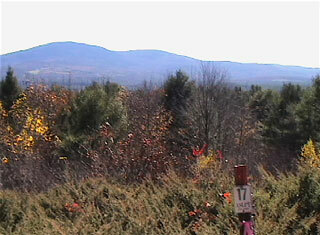 The trail's highest elevation provides views of Ragged, Kearsarge, and Sunapee Mountains. This trailhead also services the Pleasant Lake High Trail. There are several other possible Cook loop trails (flagged in blue, green, yellow, or orange but not shown). The pink flagged trail indicated in red on the map is 1.2 miles long and climbs 240 feet to its high point. 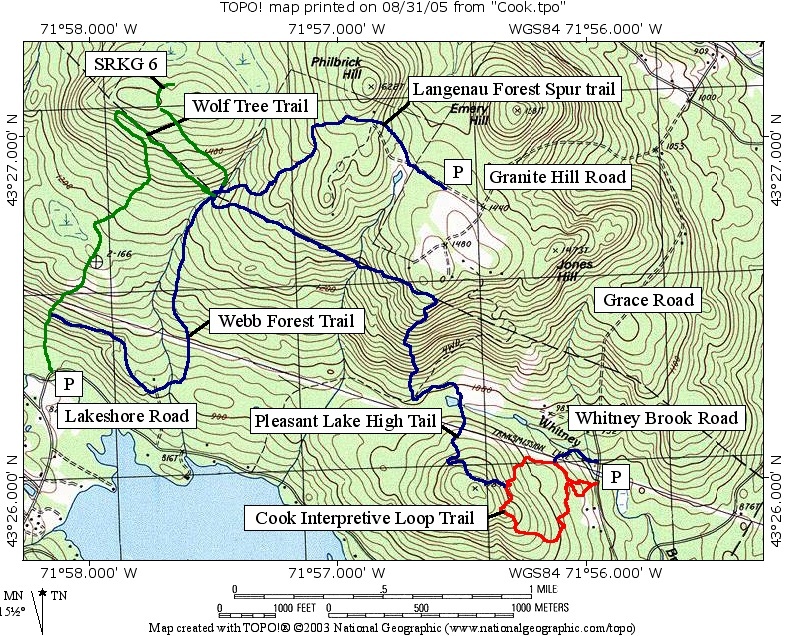 The Pleasant Lake High Trail uses segments of the Cook Interpretive Loop Trail and other Cook trails. 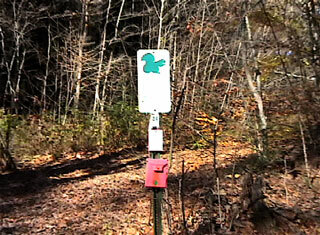 Only the Pleasant Lake High Trail is blazed, the rest are flagged with colored ribbons. The yellow diamond at 0.72 miles from the start of the Cook Interpretive Loop Trail on the profile below is at the up hill intersection with the Pleasant Lake High Trail.